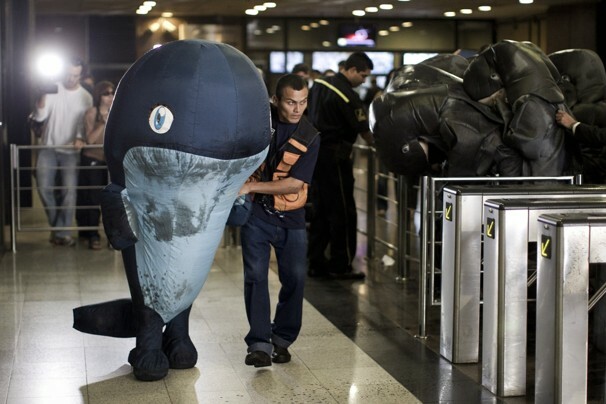 (Felipe Dana/Associated Press) - A Greenpeace activist helps a person dressed as a whale during a protest against oil exploration in Abrolhos, a large mating area for humpback whales, at the entrance of the headquarters of the Anglo-French oil and gas company Perenco in Rio de Janeiro, Brazil, Tuesday, Aug. 30, 2011. Greenpeace demands that Perenco and other companies stop their exploration projects in the archipelago of Abrolhos, in Brazil’s northeastern state of Bahia. More than two dozen Greenpeace activists have invaded the Rio de Janeiro office of OGX Brasil. That is an oil-services and shipbuilding company controlled by Brazilian billionaire Eike Batista. Wednesday’s demonstration included some protesters dressed as humpback whales. They were squirted with oil by other protesters who impersonated Batista wearing masks and suits. Greenpeace’s Brazil energy campaign coordinator is Ricardo Baitelo. He says the group wants to prevent oil companies such as OGX from exploring for oil near a national park called Abrolhos. The park includes five islands with great diversity of marine life. Humpback whales breed there starting in July.